The United States Soccer (football) team begins its 2010 FIFA World Cup campaign in South Africa on Saturday against England. The Group C match will be played in Rustenburg, northwest of Johannesburg. Anyone familiar with the history of the World Cup knows that one of the biggest upsets ever took place in 1950 when the United States defeated England, 1-0, in Brazil. Here in South Africa, a U.S. win would not be considered such an upset. While England is currently ranked eighth in the world, the United States is not far behind at number 14. U.S. coach Bob Bradley welcomes the opportunity for his team to open against England at this World Cup. "It's nice when there's a little connection to the past, but at the same time as you prepare for this game that's not a big factor," said Bob Bradley. "Whenever we're playing we do a good job of knowing what our opponents are all about. We respect our opponent. We've played against top teams in the last four years and we know what that's like. So England fits all that. They're a top team. We know their players well. We respect them, but we're excited about playing them. We look forward to it." England's style will be no surprise. Of the 23 players on the U.S. Soccer team roster, nine of them spent all or part of last season with English clubs. U.S. goalie Tim Howard plays professionally with Everton in the Premier League. "I think I've played enough against them that I like to think I have a little bit of an advantage but I don't think that's huge just because I've played against them," said Tim Howard. "In fact it's probably the opposite, you know. With the unknown you're a little bit carefree and gung-ho, you know. Knowing what I know about them, sometimes I'm actually a little bit cautious, but hopefully not in this case." 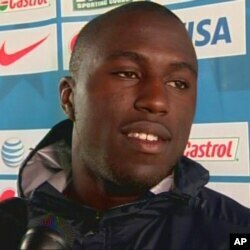 Howard's teammate Jozy Altidore played for the Premier League's HullCity last season. He said facing England to start the World Cup is a big challenge. "I think it'll be tough but at the same time great because I think the first game always sets the tone for the rest of the tournament," said Jozy Altidore. "So it'll give us a real good opportunity to put us either in the driver's seat or a put us in a good place going into the next game for sure." Altidore was presumed to be a likely starter at forward for the U.S. team until he sprained his ankle last week in practice. If Coach Bradley believes he's not fully fit by game time, he could call on Edson Buddle or Herculez Gomez, newcomers to the team who both scored against Australia in the Americans' final warm-up match last Saturday. This U.S. soccer team appears to have a number of bench players it can count on to perform at a high level. And regular starting midfielder Michael Bradley, who is the coach's son, says that's important. "In a World Cup, you know you're going to need every guy, from the first guy to the 23rd guy," said Michael Bradley. "So the fact that we have good options, that's only going to help our team." As for England, it knows it will be without captain Rio Ferdinand, who suffered a bad knee injury in training last week. That was a big blow to a nation hoping to win its first World Cup since 1966. Plus, the English were not all that impressive in their warm-up games. That does not worry midfielder Joe Cole. He indicated it is probably best they don't get overconfident. The other two teams that England and the USA will face later in Group C are Algeria and Slovenia. But both know this head-to-head opening match is the one that is drawing the most interest.